Our range of canvas shoes for men offer just the right amount of comfort and breathability to get your feet through the summer months. 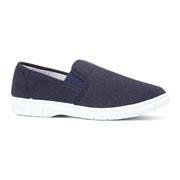 However warm the weather might be, a pair of men’s canvas shoes offer the ideal casual style for comfort and cool. 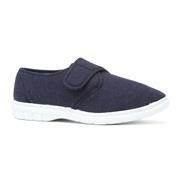 With textile uppers and a rubber sole, a pair of canvas pumps are a great alternative to trainers or sandals. 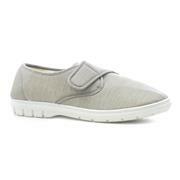 We’ve got canvas men’s shoes in a selection of colours, sizes and styles. Whether you’re looking for something laced, an easy fastening, or you’d prefer to slip into your footwear, we’ve got the shoes to cater for you. For the classic look, you might consider our Mercury Men’s range. 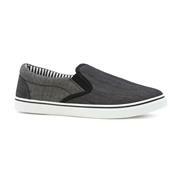 With their white laces and white soles, they're a stylish take on men's plimsolls. We also carry men’s espadrilles – an option that offers all the same functionality, but with a tad more convenience. Like all the shoes in our catalogue, our canvas, lace up and slip on shoes for men are of a high quality – but they don’t cost the earth. You can even get your men’s canvas shoes delivered to your door free of charge, and you’ll have peace of mind knowing that you’ll be able to return them in-store if needed. 23 products from £6.99 to £29.99.